In the 1960s graffiti appeared on London and New York City streets proclaiming "Clapton is God." For the next 30 years, Eric Clapton forged out a career as an extraordinary guitar player, singer, and songwriter, becoming a musician of legendary proportion. Eric Clapton's musical roots were formed by American blues artists such as Muddy Waters, Robert Johnson, and Sonny Boy Williamson. During his career, he experimented with many musical forms, including rock, pop, reggae, and even techno-jazz. However, he always seemed to find his way back to his beloved blues where his music is fueled by a life filled with personal struggles and tragedies. Clapton was born on March 30, 1945, in Surrey, England. He was the illegitimate son of Patricia Molly Clapton and a Canadian soldier stationed in England named Edward Fryer. When Fryer returned to his wife in Canada, Clapton's mother left him to be raised by his grandparents, Jack and Rose Clapp. (He received his surname from his mother's first husband, Reginald Clapton.) Clapton was told his grandparents were his parents and his mother was his sister. He did not find out the truth until he was nine years old. Clapton was an above-average student who excelled in art, but played the guitar more often than he studied. He received his first guitar as a present from his grandmother on his thirteenth birthday. As Clapton moved through adolescence, his love for the guitar and American blues music grew. Influenced and inspired by many of the great American blues artists, Clapton began playing almost full time. In the process, at age 17, he failed out of Kingston College of Art, where he was studying stained glass design. He moved to London, took a manual labor job, convinced his grandparents to buy him an electric guitar, and began playing in clubs and pubs. Soon Clapton joined his first band, the Roosters, which quickly disbanded. He played with several other British blues bands until 1963 when he joined The Yardbirds, with whom he would achieve international fame. Clapton came into the band on the recommendation of lead vocal for the band, Keith Relf, Clapton's former classmate from art college. Clapton recorded two albums with The Yardbirds, Five Live Yardbirds, a live album released in 1964, and For Your Love, the title track reaching number two in England in 1965. During his stint with the band, Clapton came to be known by his nickname "Slowhand" for his string-bending blues riffs. For Your Love found eager audiences in both England and the United States, and it marked The Yardbirds intentional move away from the blues in an attempt to break into the pop charts. Clapton, who wanted to remain a blues artist, barely played on the album, and in 1965 quit the band. Almost immediately, Clapton joined John Mayall's Bluesbreakers. Mayall gave Clapton the freedom to explore his blues style, and soon Clapton's searing blues guitar was the driving force behind the band's popularity. In 1966 the band released Bluesbreakers: John Mayall with Eric Clapton. This album, which reached number six on the British pop charts, propelled Clapton into the spotlight and, at the age of 21, marked him as a guitar virtuoso. It was during his stint with the Bluesbreakers that fanatical fans started the chant "Clapton is God." Clapton left the Bluesbreakers in July 1966, to form Cream with bass player Jack Bruce and drummer Ginger Baker. Clapton desired to break out of the standard forms of rock and blues to create a new sound that allowed more experimentation and improvisation. He wanted to start a revolution in music, and the super trio of Cream did just that. After three albums (Fresh Cream, Disraeli Gears, and Wheels of Fire,) and an extensive tour of the United States, the members of Cream became superstars in the order of the Beatles and the Rolling Stones. From these albums came legendary rock hits such as "White Room," "Sunshine of Your Love," and "Crossroads." Much to the dismay of their fans, the members of Cream announced in 1968 that they would part ways. Tension and strife created by three strong, creative personalities, intensified by the drug use of all three, proved to be too much for Cream. Before disbanding, Cream went on a farewell tour and, in 1969, released one last album, Goodbye, which went to number two on the charts in the United States. Clapton's next band, Blind Faith, became yet one more short-lived supergroup. Made up of Clapton, ex-Cream member Ginger Baker, ex-Traffic member Steve Winwood, and bassist Rick Grech, Blind Faith released just one selftitled album in July 1969. They quickly made their presence known in the music world by staging a free concert for 100,000 people in London's Hyde Park. But, after a six-week tour in the United States, the band called it quits. Clapton's most lasting work with Blind Faith is the song "Presence of the Lord." After the demise of Blind Faith, he briefly played with John Lennon and Yoko Ono's Plastic Ono Band, and then he moved on to record his first solo album, self-titled Eric Clapton. Although generally disappointing as a debut solo album, Clapton did find an audience for the song "After Midnight," which made it into the Top 40. In the spring of 1970, Clapton brought together a new band, Derek and the Dominos. They toured throughout England during the summer of 1970. By fall, they had released a double album, Layla and Other Assorted Love Songs. Much of the album was inspired by Clapton's love for Patti Harrison, the wife of his good friend, ex-Beatle George Harrison. For example, the song "Have You Ever Loved a Woman" contains the lyrics: "Have you ever loved a woman / And you know you can't leave her alone? / Something deep inside you / Won't let you wreck your best friend's home." Clapton also sings about his love for Patti in the title track, "Layla," a song that became a Clapton classic. By the early 1970s, Clapton's heroin addiction was becoming unmanageable. His drug use was fueled by the trauma of losing two of his closest friends. Slide guitar player, Duane Allman, who collaborated with Derek and the Dominos, was killed in a motorcycle accident, and Jimi Hendrix died of a drug overdose. Finally, after hitting the depths of his addiction, Clapton kicked his heroin habit using a controversial electro-acupuncture treatment. With drugs behind him, Clapton staged a comeback concert in London in January 1973. In 1974 he released his second solo album, 461 Ocean Boulevard. The album went to number one on the charts as did his remake of the Bob Marley song "I Shot the Sheriff." Through the rest of the 1970s, Clapton released a succession of albums. The most successful of these projects was Slowhand (1977), which included hits "Cocaine," "Lay Down Sally," and "Wonderful Tonight." In 1979 Clapton married Patti Harrison (who in 1974 had divorced George Harrison and moved in with Clapton). Unfortunately, Clapton had traded one addiction for another, and this period marked his fall into a serious drinking problem. During the first half of the 1980s Clapton managed to release five solo albums, Just One Night (1980), Another Ticket (1981), Money and Cigarettes (1983), Behind the Sun, (1985), and August (1986). Each album was only marginally successful. Clapton's life changed forever in 1986 when Italian actress Lori Del Santo gave birth to Clapton's son, Conor. Although this event brought great happiness to Clapton, it also marked the end of his marriage to Patti who moved out and subsequently filed for divorce. Clapton renewed his effort to give up alcohol, entered a rehab center, and became a member of Alcoholics Anonymous. At the same time, his popularity rose again dramatically after the release of the box set Crossroads (1988) and a new album Journeyman (1989). Although 1990 brought Clapton his first Grammy Award for "Bad Love" off the Journeyman album, 1990 and 1991 were marred by tragedy for Clapton. First, in 1990, Clapton once again lost close friends when guitar virtuoso Stevie Ray Vaughan and two members of Clapton's road crew died in a helicopter crash. Then, in 1991, Clapton was getting ready to pick up his then four-year-old son Conor for lunch when he received the news that the boy was dead after falling from a fifty-third-story window of a Manhattan high-rise apartment. Clapton responded to this tragedy by writing the super hit, "Tears in Heaven," as a tribute to his son. The song was featured in the sound track of the movie Rush. It also appeared on the acoustical album Unplugged (1992), which turned out to be Clapton's biggest selling album and swept the 1993 Grammy Awards. With the success of Unplugged, Clapton found the courage to return to his beloved blues, and in 1994, released the blues album From the Cradle. The album was both commercially successful and critically acclaimed. 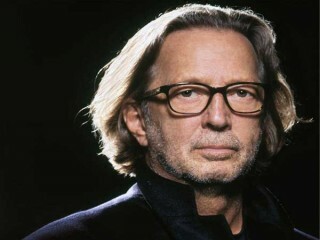 After releasing a four-CD box set, Crossroads 2: Live in the '70s, in 1996, Clapton became involved in a new age, techno-jazz duo with Simon Climie called T.D.F. Clapton, who used only the pseudonym "x-sample," and Climie released Retail Therapy in 1997. Although this experimental recording received mixed reviews, Clapton was still doing well on the pop charts. He claimed two Grammy Awards in 1997 (record of the year and best male pop vocal performance) for his collaboration with Babyface on "Change the World," which appeared on the soundtrack for the movie Phenomenon. In March 1998, Clapton released his latest project to date, Pilgrim. The album is filled with almost all original Clapton songs; most noticeable are two songs that pay tribute to Clapton's son Conor, "Circus" and "My Father's Eyes," both written in 1992. Although those looking for the Clapton of Cream found the introspective, sometimes melancholy tone of Pilgrim disappointing, others have embraced Clapton's ever-changing style of mixing blues, rock, and his own painful soul into the songs that have aged as gracefully as the singer. View the full website biography of Eric Clapton.